A contour line (also isoline, isopleth, or isarithm) of a function of two variables is a curve along which the function has a constant value. It is a cross-section of the three-dimensional graph of the function f(x, y) parallel to the x, y plane. In cartography, a contour line (often just called a "contour") joins points of equal elevation (height) above a given level, such as mean sea level. 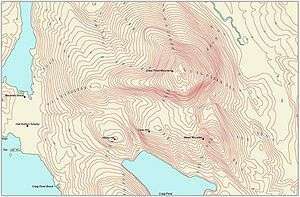 A contour map is a map illustrated with contour lines, for example a topographic map, which thus shows valleys and hills, and the steepness of slopes. The contour interval of a contour map is the difference in elevation between successive contour lines. More generally, a contour line for a function of two variables is a curve connecting points where the function has the same particular value. 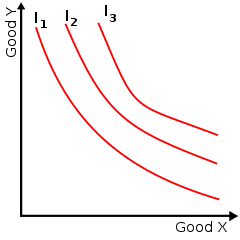 The gradient of the function is always perpendicular to the contour lines. When the lines are close together the magnitude of the gradient is large: the variation is steep. A level set is a generalization of a contour line for functions of any number of variables. Contour lines are often given specific names beginning "iso-" (Ancient Greek: ἴσος isos "equal") according to the nature of the variable being mapped, although in many usages the phrase "contour line" is most commonly used. Specific names are most common in meteorology, where multiple maps with different variables may be viewed simultaneously. 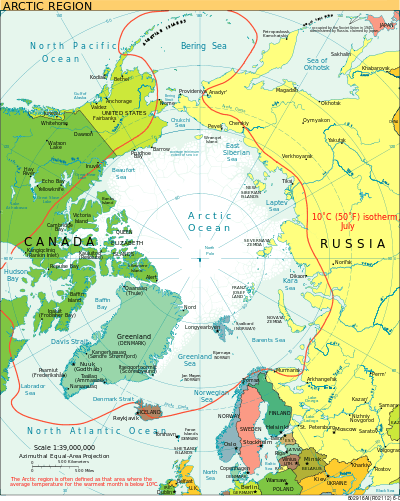 The prefix "iso-" can be replaced with "isallo-" to specify a contour line connecting points where a variable changes at the same rate during a given time period. Equidistant is a line of equal distance from a given point, line, polyline. Meteorological contour lines are based on generalization from the point data received from weather stations. Weather stations are seldom exactly positioned at a contour line (when they are, this indicates a measurement precisely equal to the value of the contour). Instead, lines are drawn to best approximate the locations of exact values, based on the scattered information points available. An isopycnal is a line of constant density. An isoheight or isohypse is a line of constant geopotential height on a constant pressure surface chart. An isohyet or isohyetal line (from ὕετος or huetos, meaning 'rain') is a line joining points of equal rainfall on a map in a given period . A map with isohyets is called an isohyetal map. An isohume is a line of constant relative humidity, while a isodrosotherm (from δρόσος or drosos, meaning 'dew', and θέρμη or therme, meaning 'heat') is a line of equal or constant dew point. The rule of V's: sharp-pointed vees usually are in stream valleys, with the drainage channel passing through the point of the vee, with the vee pointing upstream. This is a consequence of erosion. The rule of O's: closed loops are normally uphill on the inside and downhill on the outside, and the innermost loop is the highest area. If a loop instead represents a depression, some maps note this by short lines radiating from the inside of the loop, called "hachures". Spacing of contours: close contours indicate a steep slope; distant contours a shallow slope. 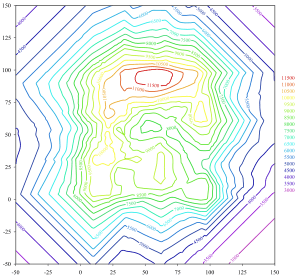 Two or more contour lines merging indicates a cliff. By counting the number of contours that cross a segment of a stream, you can approximate the stream gradient. Of course, to determine differences in elevation between two points, the contour interval, or distance in altitude between two adjacent contour lines, must be known, and this is given at the bottom of the map. Usually contour intervals are consistent throughout a map, but there are exceptions. Sometimes intermediate contours are present in flatter areas; these can be dashed or dotted lines at half the noted contour interval. When contours are used with hypsometric tints on a small-scale map that includes mountains and flatter low-lying areas, it is common to have smaller intervals at lower elevations so that detail is shown in all areas. Conversely, for an island which consists of a plateau surrounded by steep cliffs, it is possible to use smaller intervals as the height increases. Contour lines are also used to display non-geographic information in economics. 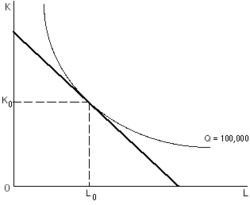 Indifference curves (as shown at left) are used to show bundles of goods to which a person would assign equal utility. An isoquant (in the image at right) is a curve of equal production quantity for alternative combinations of input usages, and an isocost curve (also in the image at right) shows alternative combinations of input usages having equal production costs. In statistics, isodensity lines  or isodensanes are lines that joint points with the same probability density. Isodensanes are used to display bivariate distributions. The idea of lines that join points of equal value was rediscovered several times. In 1701, Edmond Halley used such lines (isogons) on a chart of magnetic variation. The Dutch engineer Nicholas Cruquius drew the bed of the river Merwede with lines of equal depth (isobaths) at intervals of 1 fathom in 1727, and Philippe Buache used them at 10-fathom intervals on a chart of the English Channel that was prepared in 1737 and published in 1752. Such lines were used to describe a land surface (contour lines) in a map of the Duchy of Modena and Reggio by Domenico Vandelli in 1746, and they were studied theoretically by Ducarla in 1771, and Charles Hutton used them in the Schiehallion experiment. In 1791, a map of France by J. L. Dupain-Triel used contour lines at 20-metre intervals, hachures, spot-heights and a vertical section. In 1801, the chief of the Corps of Engineers, Haxo, used contour lines at the larger scale of 1:500 on a plan of his projects for Rocca d'Aufo. 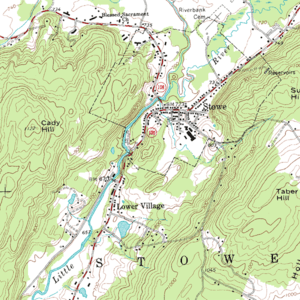 When maps with contour lines became common, the idea spread to other applications. Perhaps the latest to develop are air quality and noise pollution contour maps, which first appeared in the US, in approximately 1970, largely as a result of national legislation requiring spatial delineation of these parameters. 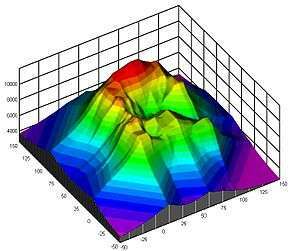 In 2007, Pictometry International was the first to allow users to dynamically generate elevation contour lines to be laid over oblique images. ↑ Courant, Richard, Herbert Robbins, and Ian Stewart. What Is Mathematics? : An Elementary Approach to Ideas and Methods. New York: Oxford University Press, 1996. p. 344. ↑ Tracy, John C. Plane Surveying; A Text-Book and Pocket Manual. New York: J. Wiley & Sons, 1907. p. 337. ↑ Oxford English Dictionary; see also: Nature, 40, 1889, p.651. ↑ Robinson AH (1971). "The genealogy of the isopleth". Cartographic Journal. 8: 49–53. ↑ T. Slocum, R. McMaster, F. Kessler, and H. Howard, Thematic Cartography and Geographic Visualization, 2nd edition, Pearson, 2005, ISBN 0-13-035123-7, p. 272. ↑ ArcGIS, Isopleth: Contours, 2013. ↑ NOAA's National Weather Service, Glossary. ↑ Edward J. Hopkins, Ph.D. (1996-06-10). "Surface Weather Analysis Chart". University of Wisconsin. Retrieved 2007-05-10. ↑ World Meteorological Organisation. "Isallobar". Eumetcal. Retrieved 12 April 2014. ↑ World Meteorological Organisation. "Anallobar". Eumetcal. Retrieved 12 April 2014. ↑ World Meteorological Organisation. "Katallobar". Eumetcal. Retrieved 12 April 2014. ↑ "Forecasting weather system movement with pressure tendency". Chapter 13 - Weather Forecasting. Lyndon State College Atmospheric Sciences. Retrieved 12 April 2014. ↑ DataStreme Atmosphere (2008-04-28). "Air Temperature Patterns". American Meteorological Society. Archived from the original on 2008-05-11. Retrieved 2010-02-07. ↑ Munzar, Jan (1967-09-01). "Alexander Von Humboldt and His Isotherms". Weather. 22 (9): 360–363. doi:10.1002/j.1477-8696.1967.tb02989.x. ISSN 1477-8696. ↑ Sark (Sercq), D Survey, Ministry of Defence, Series M 824, Sheet Sark, Edition 4 GSGS, 1965, OCLC OCLC 27636277. Scale 1:10,560. Contour intervals: 50 feet up to 200, 20 feet from 200 to 300, and 10 feet above 300. ↑ "isoporic line". 1946. Retrieved 2015-07-20. ↑ "Isobel". 2005-01-05. Retrieved 2010-04-25. ↑ Specht, Raymond. Heathlands and related shrublands: Analytical studies. Elsevier. pp. 219–220. ↑ Laver, Michael and Kenneth A. Shepsle (1996) Making and breaking governments pictures. ↑ Fernández, Antonio (2011). "A Generalized Regression Methodology for Bivariate Heteroscedastic Data". Communications in Statistics - Theory and Methods. Taylor and Francis. 40 (4): 601. doi:10.1080/03610920903444011. ↑ Thrower, N. J. W. Maps and Civilization: Cartography in Culture and Society, University of Chicago Press, 1972, revised 1996, page 97; and Jardine, Lisa Ingenious Pursuits: Building the Scientific Revolution, Little, Brown, and Company, 1999, page 31. 1 2 R. A. Skelton, "Cartography", History of Technology, Oxford, vol. 6, pp. 612-614, 1958. ↑ Colonel Berthaut, La Carte de France, vol. 1, p. 139, quoted by Close. ↑ C. Close, The Early Years of the Ordnance Survey, 1926, republished by David and Charles, 1969, ISBN 0-7153-4477-3, pp. 141-144. ↑ T. Owen and E. Pilbeam, Ordnance Survey: Map Makers to Britain since 1791, HMSO, 1992, ISBN 0-11-701507-5. ↑ Imhof, E., "Die Anordnung der Namen in der Karte," Annuaire International de Cartographie II, Orell-Füssli Verlag, Zürich, 93-129, 1962. ↑ Freeman, H., "Computer Name Placement," ch. 29, in Geographical Information Systems, 1, D.J. Maguire, M.F. Goodchild, and D.W. Rhind, John Wiley, New York, 1991, 449-460.